The Foal IgG Poster is an invaluable reference guide for those who wish to measure IgG levels in newborn foals. A newborn foal is entirely dependent on maternal antibodies, absorbed following ingestion of colostrum, from its dam in the first few hours of life for immune protection. Failure of the passive transfer of maternal antibodies puts the foal at significant risk of infectious diseases. 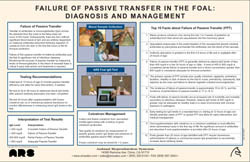 Monitoring the success of passive transfer by measuring levels of IgG in the blood of neonatal foals is critical if early intervention and treatment is required. The full color poster measures 11" x 17" and is printed on sturdy paper stock which is then laminated for added durability.